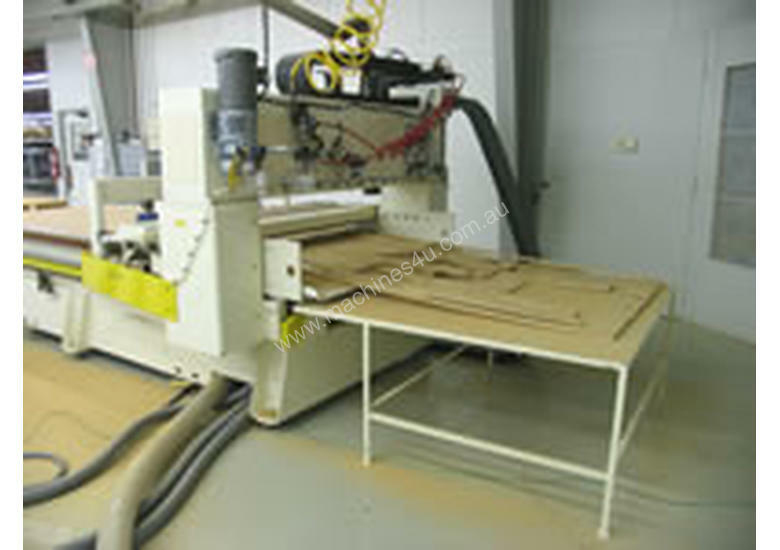 Machine high production frame parts at high speed with automatic load and unload. Nest part files from every major CAD and design software in the CNC control for custom batch production. Efficiently nest and run custom jobs with improved material yield. 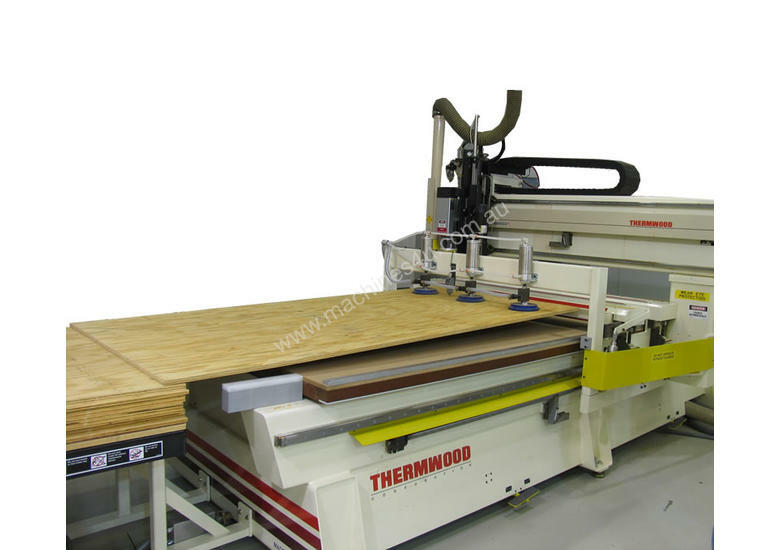 The FrameBuilder Series is available from Thermwood, the oldest manufacturer of CNC routers. Thousands of Thermwood CNC routers are in operation in 29 countries producing everything from simple wood parts to space probes. Thermwood has consistently been the technology leader with more U.S. patents on CNC router technology than all other CNC router manufacturers combined. The FrameBuilder Series machines offer important features not available from anyone else in the world, features important to your success. Before you can machine something, you must be able to hold it down. Plywood and sheet material, commonly used for upholstered frames, present significant hold-down problems. Their rough surface and tendency to warp make them difficult or impossible to hold with vacuum. In many frame applications, nests are random, so conventional vacuum fixtures cannot be used anyway. The only answer is roller hold-down, a system first developed by Thermwood. Rollers in front and behind the cutting head pinch the material to the table. It even works on stacked material and warped sheets where the surface finish is not critical, as it is with vacuum. Others have copied this approach, but their execution omits important details. For example, everyone except Thermwood uses the linear axis bearings to carry the considerable hold-down loads. We provide a patented system that uses simple rollers under the table to counteract roller forces, eliminating the hold-down load on the critical linear bearings. With high-speed production, typical of frame machining, this means less bearing wear, longer life and fewer problems. We also cover our rollers and provide an emergency stop strip along these covers where others don’t. You are not supposed to be around the rollers when the machine is running because they can be dangerous, but why take the chance? Others use moving table machines for roller hold-down applications. While there is nothing wrong with moving table machines (we build a lot of them), they are not nearly as efficient as fixed table machines for this particular application. The fixed table makes automatic load and unload extremely simple and straightforward. Automatic load and unload systems for moving table machines are complex at best. 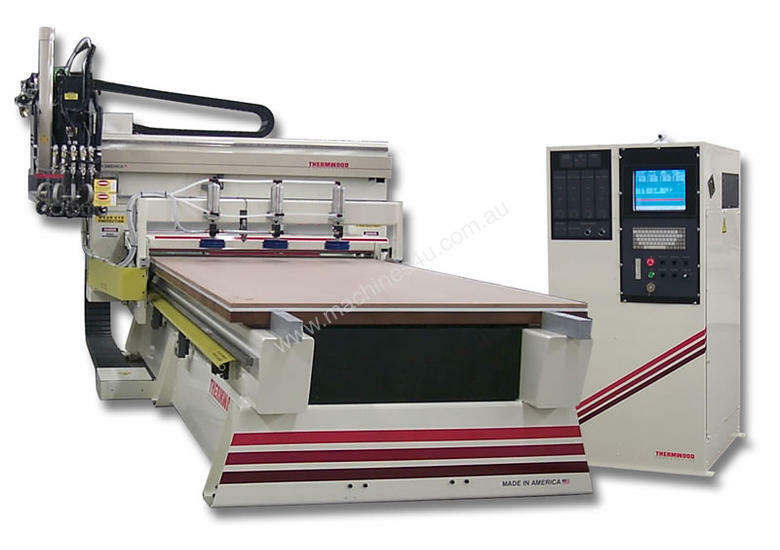 When it comes to CNC routers for high volume frame production, Thermwood is clearly the leader with highly efficient systems built to operate at high speed, 24/7. 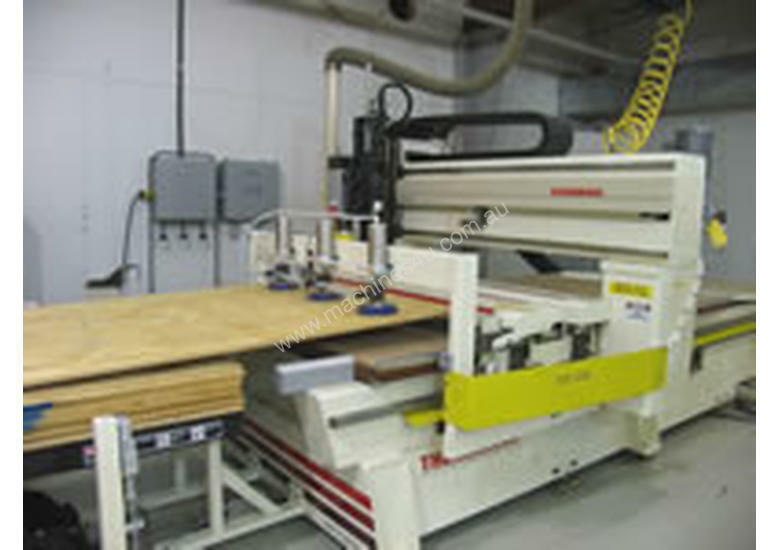 Thermwood’s control accepts DXF files from every major CAD and design program, nests them and runs them. You can even nest parts from different software in the same job. The files you want to run are simply selected, regardless of their origin, and nested together in a single job. For those who would rather do this selection process in the office, you can specify the files and quantity you want to run in an Excel spreadsheet and send this to the control. The control then accesses the files and does all the work automatically without the operator being involved. The control does the CAM and Post Processor functions automatically and creates a nest program that you just run. In creating this program, it automatically allows for the special characteristics of roller hold-down machining, a job you need to do if the control won’t. This is truly a no hassle way to handles mall batch and custom nesting jobs. Thermwood’s control also accepts Excel and CP Out files intended for panel saws, nests and runs them. Or, if you just want some rectangles, type the length and width of the pieces you want, right on the control, and it nests and cuts them. No other CNC control, from anyone, can do the things the Thermwood control does, and these things are important to your success. 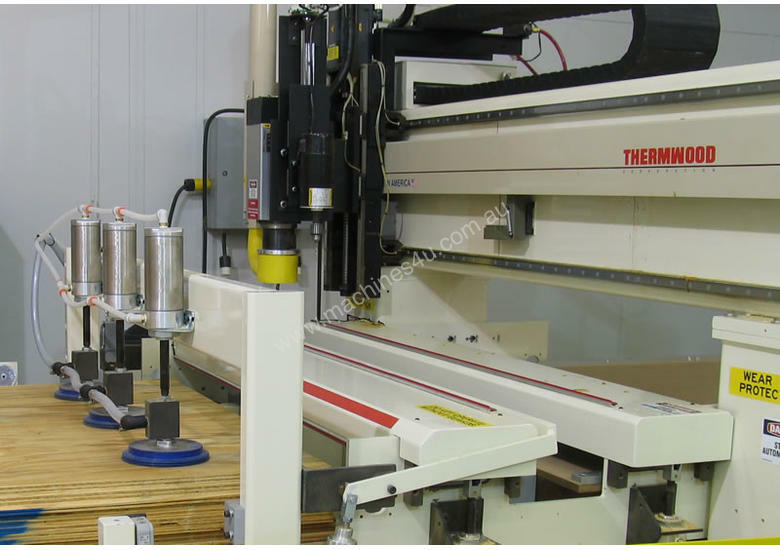 Thermwood’s automatic load and unload system for nested based production is simple, fast and efficient. An operation that typically requires two people can now be done by one. In fact, it is common for a single operator to run two or three Thermwood upholstered frame systems using automatic load/unload. The operation starts with a scissor lift located at the front of the fixed machine table. A stack of sheet material is placed on this scissor lift and it keeps the top sheet just above the level of the machine table. A Roller Hold Down system is the best solution for rough and warped surfaces. Once you leave the realm of high volume production and start to focus on smaller batches, flexibility becomes your most important requirement. Thermwood is the leader in this arena too. The key to flexibility is a control that is sophisticated enough to handle all the complexities, automatically. Simple, basic controls, often promoted for frame applications, require that the programmer and operator do the complex work because the control can’t. Thermwood’s control, on the other hand, does much of the work for you automatically, so you don’t have to. For example, Thermwood’s control does the nesting right in the control instead of requiring that parts be nested using separate nesting software and then processed through a CAM program and then developed into a CNC program using a Post Processor program. With Thermwood, simply send the designs to the control and it does the rest. The nesting, CAM work and Post Processor are all in the control and are all automatic, but the advantage of this approach is not just being simpler to use. Suppose you encounter a defect in a sheet of material you want to use. With Thermwood’s “control nesting” you simply identify the bad area and nest around it, right at the control. With others you scrap the entire sheet, or scrap the nest program, return to the office and go through the whole process again. And what about the large pieces of material left at the end of a job. With Thermwood’s FrameBuilder system, the control prints a bar code label for them. When you want to use them on a new job, simply scan the label and the control nests parts on them. With others you either scrap this material or, note the sizes, take them to the office, input these into the nest software, create new nests using these pieces, then when you are ready to run, try to locate these pieces again, identify them, get them in the required order…. actually, you probably just scrap them. Thermwood’s control even squares up these pieces, removing unusable protrusions and outcroppings to make them easier to handle and save… all automatically. With Thermwood’s control you can connect to technical service and get help, assistance and advice when you need it. The connection combines audio, visual and data through a high-tech link. You can get almost the same level of help as if the technician was right there in your shop and it is a lot quicker and easier. hold-down machining, a job you need to do if the control won’t. This is truly a no hassle way to handle small batch and custom nesting jobs.